Fantastic accommodations. Friendly, helpful and knowledgeable staff. The breakfast was one of the best we’ve ever experienced. Wonderful scenic views from our rooms. Perfect in every way and not to be missed! The fabulous sea veiw. There are lots of books and toys in the bar. Great views, wonderful staff, apartment was clean and comfortable! Orange Colom apartments are very cosy and stylish place for vacation. Stuff is really nice and very helpful. They have recomended us many good restaurants and places to visit. Definitely recomend this hotel. Staff was extremely nice and helpful. Manu and Susana were especially nice. Beautiful place, very well looked after with all needs catered too. I would definitely come back, food was great too. A lovely small hotel in a great location. Staff were lovely and friendly and spoke excellent English. Nice view, we can see the sunrise from our room, and the staff is nice, every question you asked will be answered clearly. Lock in a great price for Orange Colom - Seaside Apartments – rated 9.2 by recent guests! Orange Colom - Seaside Apartments This rating is a reflection of how the property compares to the industry standard when it comes to price, facilities and services available. It's based on a self-evaluation by the property. Use this rating to help choose your stay! One of our top picks in Portocolom – and a guest favorite. 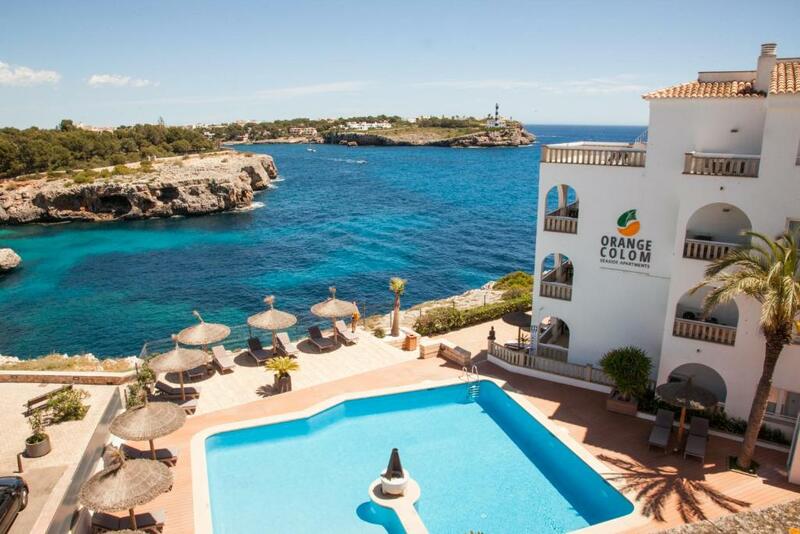 Featuring a shared swimming pool on the seafront, Orange Colom - Seaside Apartments is located in Portocolom. The property offers air-conditioned apartments with free WiFi and a balcony with sea views. Each apartment or studio has a living room with a sofa, flat-screen TV and kitchenette. The bathroom comes with a bath or shower. Orange Colom - Seaside Apartments is ideally equipped to welcome cyclists. The property has storage rooms, a repair shop and an area to clean the bicycles. There is a massage room available as well. The property offers several services, including airport shuttle or bike and car rental. There is a mini-market on site. Cala Marçal Beach can be reached in 10 minutes on foot. Vall d’Or Golf Club is 3.1 mi from the property. Guests can visit Mondrago Nature Reserve within a 20-minute drive. This property also has one of the top-rated locations in Portocolom! Guests are happier about it compared to other properties in the area. This property is also rated for the best value in Portocolom! Guests are getting more for their money when compared to other properties in this city. When would you like to stay at Orange Colom - Seaside Apartments? Featuring a private balcony with sea views, this air-conditioned apartment has a living room with a sofa and flat-screen TV. A hob and fridge are included in the kitchenette. The bathroom comes with a bathtub or shower. Featuring a private balcony with pool views, this air-conditioned studio has a living room with a sofa and flat-screen TV. A hob and fridge are included in the kitchenette. The bathroom comes with a shower. This apartment has a balcony, stovetop and dishwasher. This apartment features a balcony, kitchenette and sofa. After 5 months of renovation, we opened our doors again in 2014. We offer luminous and well equipped apartments. Enjoy a comfortable stay in our exclusive apart-hotel. House Rules Orange Colom - Seaside Apartments takes special requests – add in the next step! Orange Colom - Seaside Apartments accepts these cards and reserves the right to temporarily hold an amount prior to arrival. Please inform Orange Colom - Seaside Apartments of your expected arrival time in advance. You can use the Special Requests box when booking, or contact the property directly using the contact details in your confirmation. No parking area so this was difficult .We would have preferred a sunny balcony however we didn’t specifically request this at time of booking . Room service is not so good, they only clean the room but without changing the bed sheet and bathrobe, also the free bottle water. The breakfast was so simple. It was a very welcoming hotel. The hotelstuff helped us celebrate our daugthers birthday and made a fantastic surprise, chocolate fondue. The room was nice and the poolarea was god. The free breakfast was very very good, but the dinner menu and food not so great ! Everything at Orange Colom was super ! Location was very central and Portocolum was very a very quaint town and not so ostentatious as other areas of Mallorca. The rooms were very clean, staff very accomodating and the atmosphere so relaxing. The views over the bay from a seaview balcony is fantastic!, the place itself (Porto Colom) refreshingly little exposed to mass tourism, but with all the infrastructure (restaurants, etc) we were looking for. Size and layout of the room very nice and perfectly adequate. Conveniently located in quiet place with breathtaking view, yet within walking distance to town beach, grocery stores and food places. It has nice restaurant and very kind personnel. They serve quite good breakfasts. The apartment I was in was spacious and clean, well equipped, with balcony, air conditioning and comfortable beds. It suited all our needs from the point of view of a family with children. Would recommend to anyone who's seeking a nice place to take a rest in good conditions for a reasonable price. shower pressure is pathetic, even by "spanish" standards apartment was quite "worn" and in dire need of maintenance beyond the brush of paint it seemed to have gotten. pictures look a lot better than live. e.g. water? fungus? stains on ceiling, doorknobs/handles about to fall off, batthub floor wobbling, rust on various metal frames and fixtures and so on. What a fantastic hotel. The decoration is running within the bar and restaurant area. The rooms are bright, spacious with stunning views over the sea. The rooms were cleaned everyday. The staff are excellent all friendly and can’t do enough for you. I would highly recommend this hotel. Fabulous.